Celebrating 36 Years of Deliciousness! It’s a rare gem to find a restaurant that has been serving up good food over three decades and those who do, deserves a standing ovation. Run by a husband and wife team, New Formosa Restaurant, located in SS2 at Petaling Jaya, certainly deserves an accolade for their joint effort. New Formosa is one of the oldest Taiwanese restaurant in the vicinity and has been serving authentic Taiwanese cuisine to many since 1980. The owners, Mr. Lee Weng Eng and Mrs. Jeanie Lee, are such dedicated owners who runs New Formasa every day throughout the year and only closes for a few days a year. While Mr. Lee, who happens to be the chef, runs the back kitchen, Mrs. Lee is the perfect hostess in the front of the restaurant. With 36 years and counting, New Formosa is celebrating their 36th Anniversary with a delicious bang, which includes celebratory menus of New Formosa’s signature dishes and the Taiwanese Formosa Stone-Fire Pot promotion. Diners are treated to a long list of scrumptious Taiwanese dishes that has continue to be favorites throughout the years. Seating are limited and New Formosa gets really busy so make sure to make your reservations if you are dining in parties. To celebrate any special occasions, diners can opt for New Formosa’s Set Menus that caters from a minimum of 2 pax to 10 pax. Prices ranges from RM68 to RM598 for the various set menus. For more details, please check out the full menus here. To celebrate any special occasions, the Formosa Special Combination is a great and gorgeous platter for indulgence. Showcasing five various dishes all on a platter, diners are treated to New Formosa’s signature dishes that are truly unique and deliciously tempting. Besides the pretty Oriental presentation of the dish, the portions are generous as well. The Butter Fish Slices Formosa Style is a treat of crispy golden fish slices sautéed with lots of buttery crumbs and curry leaves. The dish is beautifully aromatic and has a lovely richness of buttery notes. I heard that New Formosa does a mean Butter Eel version too! Yam Balls sounds a bit mundane but rest assured, these are delicious with a lovely creamy powdery yam note. Another favorite dish of mine on the platter as the croquette is really flavourful and moreish. The Deep Fried Oysters Taiwanese Style is simply divine. Just the perfect size oysters in light golden crispy batter enhanced with crispy basil leaves are beautifully succulent. As soon as one bites into the oysters, the juiciness fills the mouth with a glorious briny flavour of the oyster. Taiwan Famous 3-Cup Sotong is a twist from the classic chicken version. No complaints here as the squid makes a nice change from the chicken and really took on the savory, sweet and aromatic flavours of the classic 3-cup sauce. The last one turned out to be quite unique. Stuffed Lotus Root with Special Fish Paste combined the unique texture of crunchy lotus root with the bouncy fish paste. The subtle sweetness of the lotus root goes well with the savory notes of the fish paste. Bamboo Yam Rice is another signature dish of New Formosa. There is much to love about this dish. Served in a long bamboo case, the fluffy yam rice is gorgeous in flavours. Lots of ingredients of yam, pumpkin, Chinese sausage, dried shrimp, mushrooms, fried shallots and scallions made up the rice. It’s no wonder the rice is so tasty. The dish is literally a complete one-dish meal on its own! In every Chinese meal, fish is always a must. Here, we had the Local Sea Bass with Hot Bean Sauce and Mantao. Albeit unusual to serve fish with Mantao but it is there for a reason. The sea bass is drenched in a piquant hot bean sauce that beckons for that bun to soak up the flavours for more enjoyment. The sweetness of the silky flesh of the sea bass still manages to stand out pretty well against the heavy rich sauce. Crab lovers will rejoice at New Formosa’s Sweet & Sour Crab Claws. I know I did. And one of the best perks of the dish is that New Formosa serves crab claws alone in this dish. The claw is the more sought after part of the crab and here, diners can dig in and enjoy the crab claws cooked in a luscious sweet and sour sauce with light laces of egg strands. The sauce is simply marvelous and it hits all the right balance of sweet, savory, spicy and tangy notes. I couldn’t resist enjoying the sauce with mantao buns. 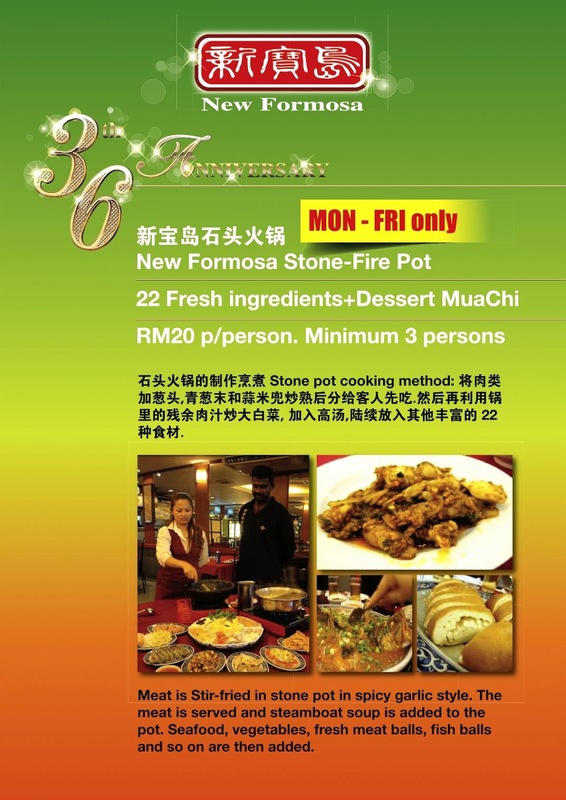 Besides all the signature dishes from the set menu, diners can enjoy New Formosa Stone-Fire Pot promotion for only RM20 per person (minimum 3 persons per table) plus a free MuaChi dessert. Featuring 22 ingredients, this hotpot is such a treat and great to end the day with such a soothing meal of soup and fresh ingredients. This promotional price is available on weekdays only and for a limited time so call for more details. 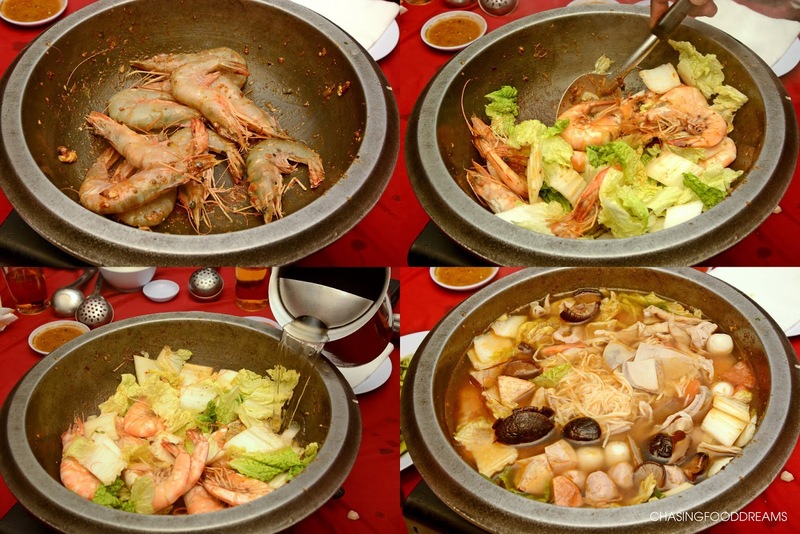 There are various steps to enjoying this Taiwanese hotpot. First, the staff will sauté the aromatics and the special Taiwanese Sa Cha sauce (Satay sauce) and add in chicken and squid. 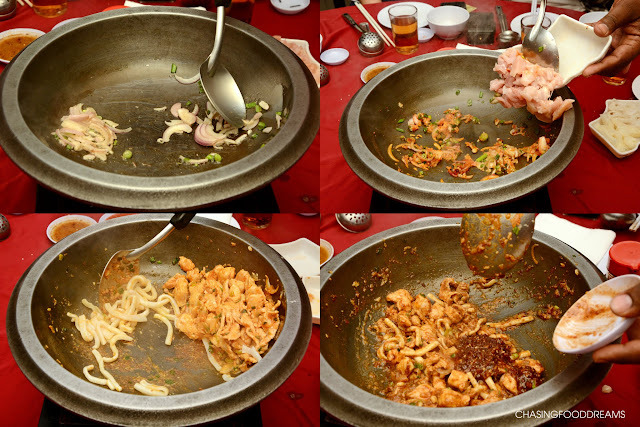 Once that has finished cooking, we are told to enjoy the chicken and squid as they are dishes up and served. The smoky moreish flavours of the Sa Cha sauce is quite addictive. Prawns are added to the pot and the cooking continues. These large prawns are additional order and are not part of the promotional price package. Then the rest of the ingredients are slowly added in different stages of cooking to be enjoyed throughout the meal. Stock is added for the ingredients to be cooked in. What makes New Formosa Stone-Fire Pot worth savoring are the classic and unusual ingredients that goes into this hotpot. 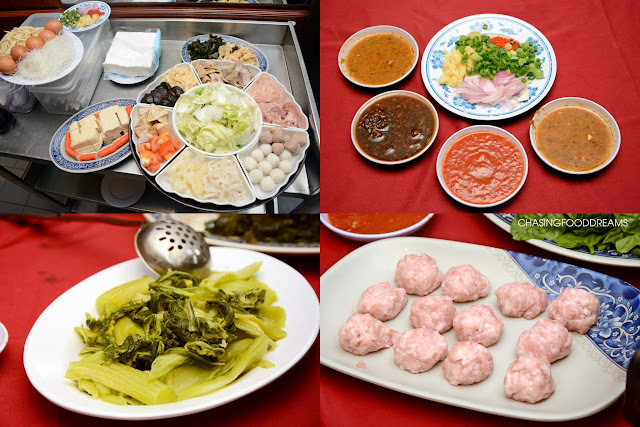 From Chinese cabbage, fried yam, tomatoes, assorted mushrooms, corn, angle luffa, seaweed, boiled mustard leaves, bean curd to fish maws, meat balls and fish balls, minced pork balls, pig stomach, pig intestines and the list goes on. The soup was so sweet and tasty as the ingredients continue to be added and cooked. There is a nutty and sublime flavour of the soup that I enjoyed that night. It is quite different from our usual hotpot flavours as this one is richer and nutty with a smoky note. At the end of the hotpot meal and if you still have more room, do enjoy homemade noodles, vermicelli and egg! Just when I thought the meal cannot get any better, Mrs. Jeanie whipped out her favorite dessert of Green Tea Pudding with Red Bean and Sweet Yam in Honey Sauce. Though both are not part of the hotpot package, it might be worthy of an order as these are unique desserts that end your Taiwanese meal on a fresh and sweet note. The chilled Green Tea Pudding with Red Bean has a QQ textured konyakku green tea jelly with an intense bittersweet green tea note. The red bean paste offset the green tea with some sweetness. The Sweet Yam in Honey sauce is simply a must-order! Cooked yam is coated in caramelized honey sauce and quickly soaked in cold water to give the yam its famous crunchy crystallized texture with a soft creamy inside. Simply aromatic and super scrumptious!! If you have never been to New Formosa, head on over for a taste of Taiwanese cuisine from the passionate owners. Food at New Formosa are dishes that diners will enjoy after a long day at work. The dishes are comforting, reflecting memories of home cook dishes that many will enjoy. With their various set menus and promotion going on this 36th Anniversary, it’s a great time to taste what New Formosa has been offering all these years to many diners. I think those crabs are calling my name. Stone firepot cooking looks interesting, sure would love to try. i try to call them but nobody pick up my call?? ?